Mobile is now the top way account holders interact with their financial institution. According to The Wall Street Journal, 80 percent of consumers name mobile experience as one of the most important factors in choosing their bank or credit union. 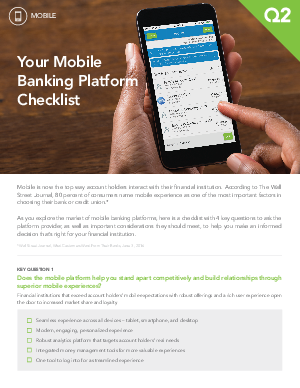 As you explore the market of mobile banking platforms, here is a checklist with 4 key questions to ask the platform provider, as well as important considerations they should meet, to help you make an informed decision that’s right for your financial institution.